Winnipeg: J. Gordon Shillingford, c2012. This poetry month, I must share some poetry. Here is a book I picked up after reading Vermette's The Break, to hear more from her, even if this was written first. 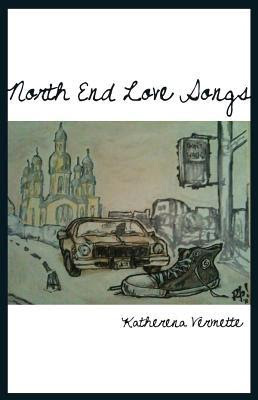 It's a collection looking at life in North End Winnipeg, the same setting as her novel. Again, she is excellent at evoking a setting, a sense of place with just a few words, a few images. Here we have young girls walking down the middle of the road in summer, with slushes in hand; and I was instantly transported back to my own early teen years. She focuses on the relationships between young women, and on describing various girls using bird metaphors in one section, which I found especially appealing. Her poems are short, and sparely written -- her style is simple but carries a lot within in. It's an honest voice, and realistic. The simplicity of the voice allows for the emotional connection to the story that's unfolding. In the second and third sections of the book, she delves into the life of her missing brother, just another young man who didn't make it home, and no law enforcement seemed very concerned about it at all. Small details of their relationship, like his heavy metal music playing all throughout the house, or asking to borrow his sweater the last time she saw him, add resonance to his absence. The depth of character and straight talk about the political realities faced by the Indigenous community in Winnipeg is straightforward but reveals unexpected moments, like a spotlight aiming at a frozen moment - the same effect she created in her novel, though with (obviously) more narrative continuity there. I think this is an easy read in the sense of its structure, but with currents of content that will catch at a reader's emotions and perceptions. She finishes with a powerful set of "verses in many voices", a poem called "I Am A North End Girl". It's a chorus of women's stories and voices which don't hold back. The effect is to hear lives being lived, without judgement being passed. This book is another important read that I'd recommend to all Canadians in this year of reconciliation -- it's a voice of understanding and experience that is much needed. North End Love Songs won the Governor General's Literary Award for poetry in 2013, and I hope more readers will discover her now through the attention on her new novel.